In 2011, more than 36 million tons of food waste were generated in the U.S. Of this, a whopping 96% went to landfills or incinerators. The goal of the U.S. Environmental Protection Agency’s food recovery hierarchy is to maximize food use and minimize food waste. 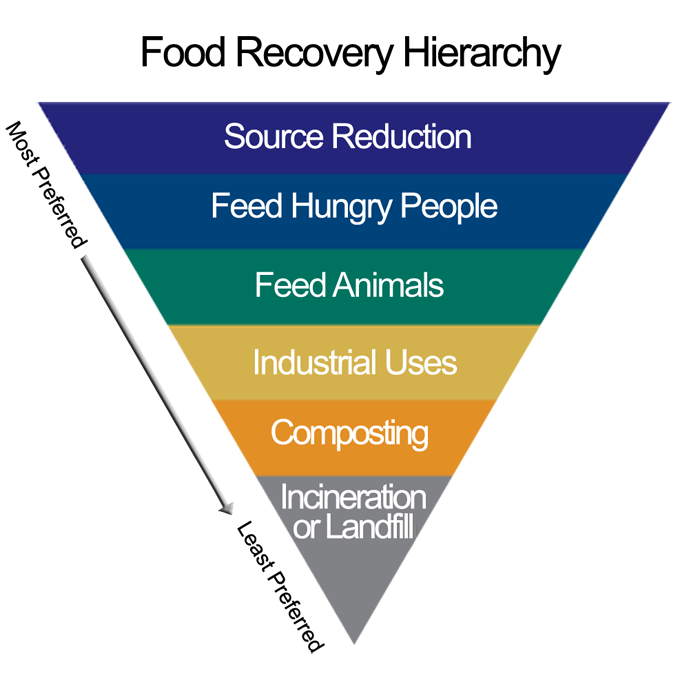 The hierarchy has been integrated into the Food Recovery Challenge, part of EPA’s Sustainable Materials Management Program. Preventing food waste is the top priority. Purchasing the correct amount of food, using it while it is fresh, and consuming leftovers reduces food waste and saves money. Next, the focus moves to ensuring that edible food goes to hungry people through shelters, food banks, and soup kitchens. Food that cannot be used by humans may be useful in animal feed or industrial applications, such as biofuels. Composting food scraps puts nutrients back into the soil. With these strategies, landfill disposal becomes the last resort, rather than the top destination, for food waste. For more information about food waste and EPA’s Food Recovery Challenge, visit www.epa.gov/smm/foodrecovery.